Welcome to the Ninety Second Edition of the Owen Guns Bulletin. 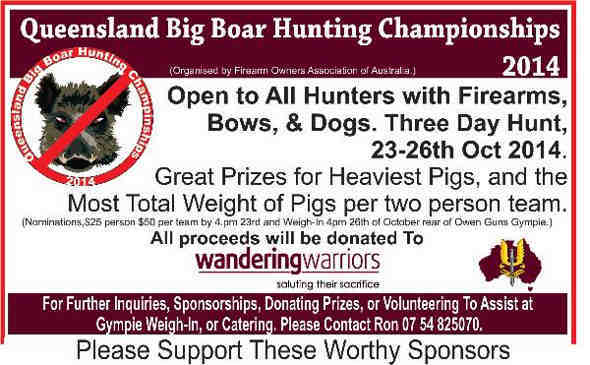 October 23 to 26th October 2014, Queensland Big Boar Hunting Championships 2014. Please click the Links above for details. Admission That PTAs Are Just IMPOSED Police Administration. 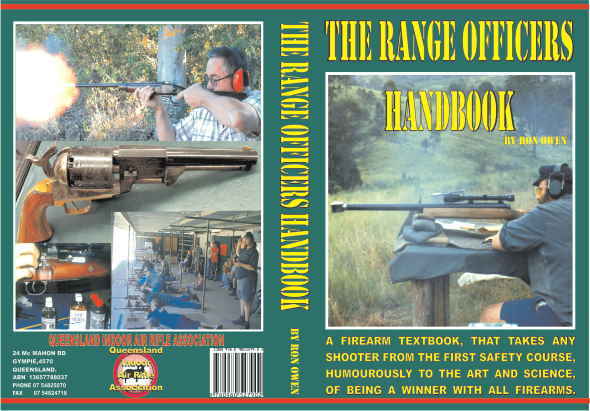 As the person has a lawful authority, (even though in a free country a person should not need one) a current shooters licence in the correct category and the Licenced Dealer gives the Acquirer a copy of the Police Register the Form 10 document of which a copy is forwarded to Weapons licencing so they can make the changes to the Police electronic register. The Acquirer has the justification and having paid and waited months for a licence the excuse. So why should we have to go through the long inconvenience of waiting and paying the fine of $33 for each application? Well after many weeks of silence besides a mis-informed response from the Ministers office. I received a letter which admits that the licence is the lawful authority and gives examples to that affect. This proves that without even changing legislation the PTA imposition fining us $33 each transaction can be discarded and done away with, at the will of the Police Minister. We should all write and quote the above Section 35 1 (1) ( c) and above QPS letter and ask the QPS for the return of $33.00 for the applications that have been falsely imposed on you. Now we have had the contention removed concerning Clive Palmers stance on human rights and the rights of Law abiding firearm owners. Clive Palmer has shown us how quickly a Bill to Amend the Weapons Act 1990 can be brought to parliament. 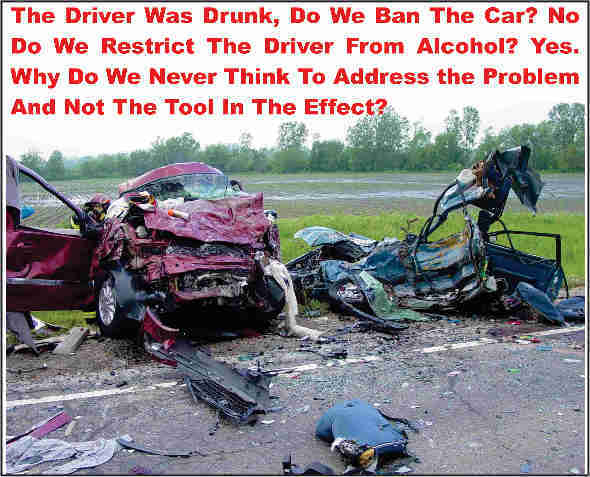 Unfortunately, it is not liberating us from the chains and shackles of the prohibitions and costs of the Weapons Act it actually increases them. The Weapons (Digital 3D and Printed Firearms) Amendment Bill 2014 is purely proscriptive, as it will make law that will outlaw, confiscate, prosecute and prohibit not just firearms, or Digital 3D firearms, but the transmission of electronic information concerning firearms. The amendments will make current licenced Armourer manufacturers who are already licenced apply and pay for another licence that will allow them to manufacture parts from a 3D printer. 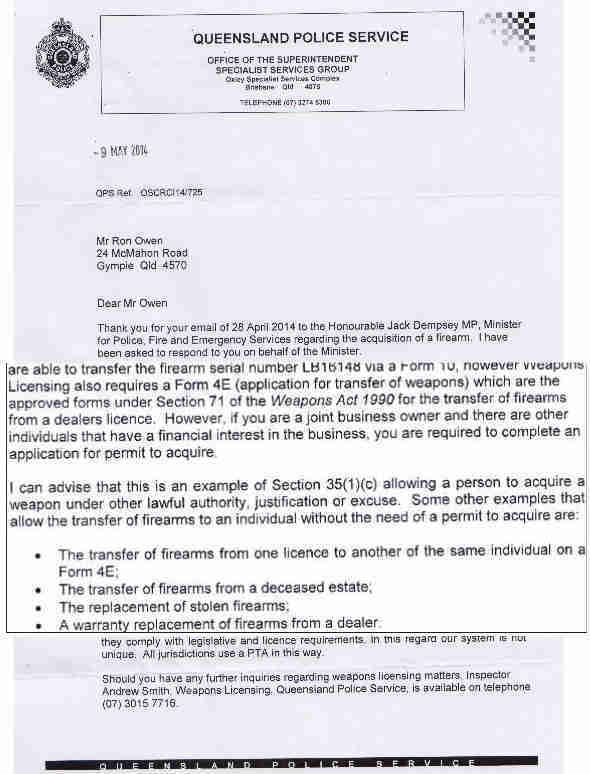 People in the future who wish to purchase 3D firearms will have to have a separate licence for their 3 D firearms. If you wish to make a submission to the Legal Affairs and Community Safety Committee we have till Friday the 18th July 2014 to let them know your thoughts on further proscriptive controls in the Weapons Act 1990. Currently, all arms capable of causing bodily harm (even airsoft, which would be debatable on that point) come under the definitions of the Weapons Act 1990 no matter how they are made. So there is no need at all for building in another group of firearms that they describe as being made in an additive way. Imagine the courts trying to sort out if the firearm had been made in an additive way as it had welded parts as welding is an ‘additive’. The Palmer Party Bill also prohibits the communication of firearm information from, or to people who are not licensed to manufacture 3 D firearms. So when you send an email with and attachment that has a 3D diagram of your licenced firearm and the Internet Police catch up with you. You will have to explain that three dimensional drawing that have three dimensional specifications Length, Breadth and Depth on them are not, or cannot be made by a 3 D Printer. That could be difficult as once specifications are known they can be manufactured with modern 3 D printing machines. 3 D printers are not limited to plastic, they are using metal powders and are sintered into place by a Laser. The words from the Bill “manufacture the firearm using an additive manufacturing process”, as well as welding could apply to all moulded parts such as a plastic rifle stock, or a sintered part, ( powder moulded steel), or a Aluminium/ Magnesium die cast, or a medieval 14th Century Cannon barrel that’s ‘additive’, as they add the bronze, or iron into the mould. A 3d Design Drawing which means Three Dimensional is all it will take, to turn you into a criminal. Banning distribution of information is straight out of the Gestapo Notebook. (b) publish the digital 3D firearm, or a document that includes the digital 3D firearm, to the public, including publish the digital 3D firearm or document on the internet. A person must not knowingly distribute a digital 3D firearm unless the person is authorised to do so under a digital firearm licence. (c) if the digital 3D firearm is a digital 3D model of a firearm that is a category D, H or R weapon—200 penalty units or 3 years imprisonment. 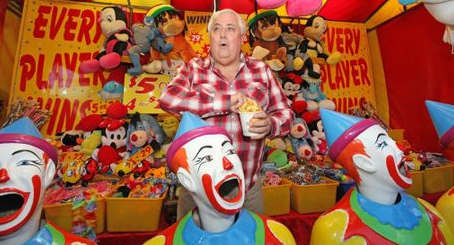 Clive Palmer in not playing the idiot, he is a showman with a Greedy, Tyrannical agenda. This Bill was introduced by Carl John Judge who has been a member of the Queensland Parliament since March 2012. He was elected as a member of the Liberal National Party, and then disendorsed by a vote of the parliamentary party, he sat as an Independent from 29 November 2012 to 6 June 2013 joined the United Australia Party (UAP) till 28 February 2014. Then joined the new Palmer United Party on 30 April 2013. Carl John Judge has a Masters of Human Services Management, a Bachelor of Policing (CSU), Advanced Diploma of Public Safety (Police Investigation), Diploma of Public Safety (Policing), Advanced Certificate in Policing (QUT). He was a member of the Queensland Police Service from1991-2012 retiring as a Senior Sergeant, between 1995 and 1996 he was a Detective; RSPCA Regional (Animal Cruelty) Inspector. A ripe candidate for Clive Palmers ‘Politicians for Sale’ Party, as Clive has proved that he can buy electorates not just by outspending all opposition and claiming all his expenses back from the Electoral Commission, he does not even have to win as long as he gets over 4 % he gets it back. He has the available funds so has no reasons to not spend his way into parliament. Then buy other politicians on the smell of his financial gravy train to carry out Palmers political objectives. Palmer may appear to stand up for the little man, but we only have to scrape the skin a little and like this example, find that the sole beneficiary of all of Clive’s actions is, Clive. Palmer’s pattern that appears to be increasingly clear: that is behind all the bluster, grandiose claims and bellicose self- aggrandisement, publicity seeking, lies a reality that he wants his developments to be approved, he wants to train everyone to Kow Tow, or he will bully them into submission with money and threats of legal action. Palmer has been repeatedly accused of spending huge sums of money to buy votes; he has also been accused of using it to effectively buy seats in Parliament by offering things to the elected representatives of other parties in his attempts to poach them. Our Nat/Lib Labour leaders are gangsters but they are not billionaire gangsters they have to have some humility when they deal with their bankers, but not Clive. Clive has the objective to be the only free person, no matter how many people he has to enslave to get that power. He has to be stopped, hopefully at the next election. He will be working as we speak to get control of a major media outlet. At the same time that he is suppressing electronic internet media from law abiding firearm owners. Under tyrants like Germany, USSR, Japan, the penalties for having an unlicensed typewriter, unlicensed printing machine, or even a radio receiver was death or worse. Owning a banned book probably brought down a penalty similar to what this Bill will do in 2014. UNTILL WE BEGIN TO ADDRESS THE REAL PROBLEMS, WE ARE DOOMED TO REPEAT THEM. These days in the Australian Socialist Third Reich, for crimes against the Weapons Act we can be jailed, or fined, convictions recorded and you lose all your firearms, lose your job, your livelihood because our leaders in the Nat/Lib, Labour Party or the latest Clive Palmer Party proscribes your actions as against the State. Yet, you the firearm owner, have not hurt anyone, you have not robbed anyone, you have not defrauded anyone, in all of our eyes you are an innocent member of our society turned into a criminal on the whim of the idiots we have running our lives. The hypocrisy is idiotic at the beginning of the Explanatory encouraging Members to vote for it are the words “Consistency with Fundamental Legislative Principles- It is recognised that legislation should have sufficient regard to the rights and liberties of individuals”. Then goes on to say. Mr Carl Judge MP uses the key words “to effectively protect the community and all citizens alike.” and “inherently exposes the community to very real and significant risk.” Without providing one skerrick of evidence that the current legislation, or any legislation on firearms protects anyone, except the housebreaker, or the mugger, or the robber. These are the only people who benefit ‘comfortable workplace’ firearm legislation. They are the only ones who are the protected. As the current Weapons Act 1990 has all manufacture of firearms included, no matter how they are made, there is nothing new except that this Bill goes further into banning electronic documents that give designs of firearms. Any firearms can be made by ‘additive’ means, can all be dragged into a crime with this legislation. The Police will have a field day, set up an internet department watching for emails or downloads with firearm drawings and specifications within them. Will they class hammers or axes or machetes as Weapons to be monitored in case they can be made by a 3 D Printer? Will the Blacksmiths hearth, where many firearms have been manufactured be the next thing to be controlled and licenced. Restrictions on freedom of information, on technical information inevitably lead to restrictions on political opinion itself. There is very little distance between banning books, or banning documents and what George Orwell called ‘Thought Crime’. With this sort of legislation they are banning the creative talents of people that invent and design. This kind of legislation has no place in a society that values freedom of expression and democratic governance. The conceit that these politicians should presume to sanction designs that have been created in the mind of the inventor and set into a documents is inimical to the most fundamental values of a free society. It is Time to Speak out Loudly, or Suffer being Treated as a Poor Minority. Speak Out, or prepare the needle and thread ready to sow the patch on your clothes. This family company has been making firearms in the Gardonne Valley Italy, for over a 100 years competing with Italy’s best producers. They are world known for their engraved double express rifles, these are great to look as and highly practical for Australian conditions. 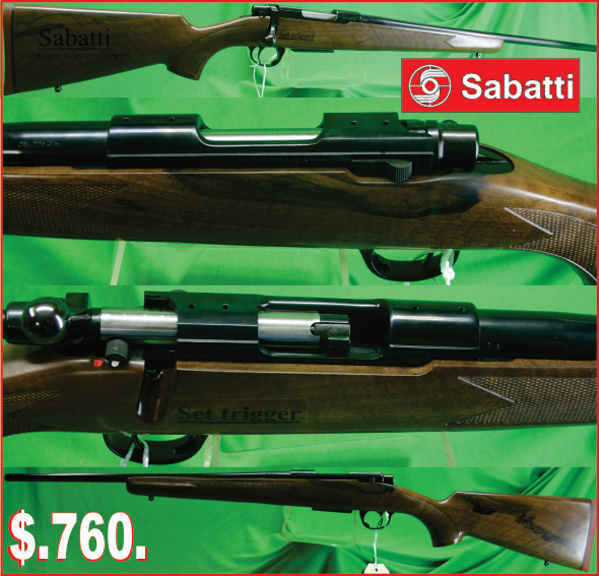 Sabatti Model 85 at the once only price of $760. they are drilled and tapped to take Weaver type bases. NEW FIREARMS. New Centre Fire Rifles from $499. After the above marathon bulletin the is not much room for firearm and accessories but please phone 07 54 82 5070 or 07 54 824099 for any shooting needs that you may have. It is our 40th year of serving Shooting Customers 40 years since Owen Guns began selling firearms ammunition, so please make use of our experience and give us a call. 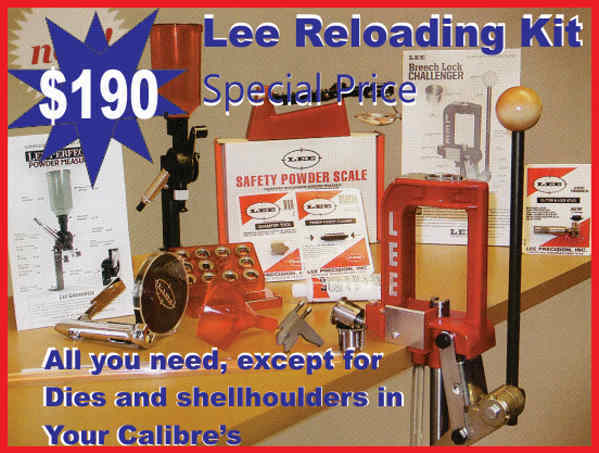 Of course email on owenguns@spiderweb.com.au is a great option as well. Ron Owen.